While I wait for the lawn to dry out so I can mow it, I thought I’d dash off this quick letter to get you caught up on my past week in the garden. First off, the weather. We set two new records for high temperatures this past week, with temperatures around 82 F on a couple of days. The plants are definitely noticing and some trees like my Japanese Tree Lilac, Syringa reticulata, are almost fully leafed out. You can see why the egg hunt in my backyard is a popular event! I’m sure when I go out later today to mow the lawn, which I left uncut to make it easier to hide eggs, I’ll find an egg or two. I always do, either right after the hunt or a few days or months later. Of course, what I find is mine to keep. Out in the vegetable garden, I finally sowed seeds for radishes and planted onion sets on Friday. Since I’m planting by the moon phases, I had to wait until at least March 30th to plant these root crops, since I missed the previous period of the waning moon which ended on March 14th. This is the latest I’ve sown radishes in a while, so I’m hoping for cooler temps so they aren’t too hot when I harvest them. I’ll report back in about three weeks to let you know how they are doing, as some of them should be ready to pull and eat by then. My peas all look good, and I’m seeing little sprouts of spinach and lettuce now, too. I’ve done nothing to protect these seedlings from rabbits so far, but I think I’ll need to do something soon before they figure out that there are “good eats’ in the garden. I know this week as long as the temperatures stay warm, some people will ask me if it would be okay to plant tomatoes outside now. I’ll tell them emphatically no, as we will still have some frosty nights between now and our usual frost-free date of mid May. I wrote about that very subject for my weekly newspaper column this week. Don’t get fooled into planting warm season crops too early. I hope all is well in your gardens and that you had a happy Easter weekend. P.S. My Easter gathering may have been the only one where we got out the Fiskars® Momentum™ Reel Mower for people to try out. My sister and a couple of nieces pushed it around a bit and commented how easy it is to use and how fun, too. Unfortunately, I could not get them quite organized and focused enough to mow the entire lawn, so I’ll be doing that today. That’s okay…you all know how I enjoy mowing! Fun post, Carol - and your tulips are spectacular. My favorite part is the way everyone got to try out the new mower...been rereading Adventures of Tom Sawyer? PS Did you really hide some eggs in the compost pile? Anyone hunting for those deserved extra $$! Your tulips are beautiful, and I haven't had an Easter egg hunt since my girls were little. Such fun! Oh how I wish for warm temperatures here - still in single figures. 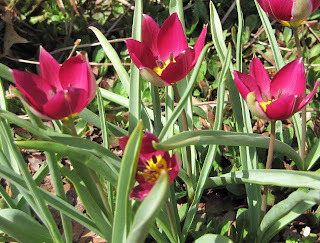 Beautiful tulips, it will be some time before mine bloom so I'll just enjoy yours! Hi Carol - It's been so warm here in Toronto that the tulips which weren't even blooming 2 days ago are almost finished this afternoon. Everything and everyone will be in for a shock if/when it gets cool again. But don't you just love how everything is awake all of a sudden? P.S. 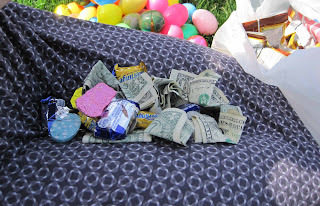 Can I come next year for the egg hunt - my grandchildren will be expecting money if they see your post. I am glad you had good weather for the Easter egg hunt. I never went to one when I was a kid. I live in Central Florida and really miss the Tulips, Crocus etc. I am originally from New York. I was in the grocery store tonight actually sniffing the Hyacinth which the floral dept. stocked for Easter. Your photos are beautiful. ...keep posting about your "northern" bulbs. That Fiskars mower does make some people giddy. I bought one for the Executive Producer to use on what little grass we have left. It cracked me up to hear him on the phone with a friend, telling him all about it.